Gorgeous wood grains stretch from corner to corner, decorating every inch in natural beauty. Product Description Nature Scout. 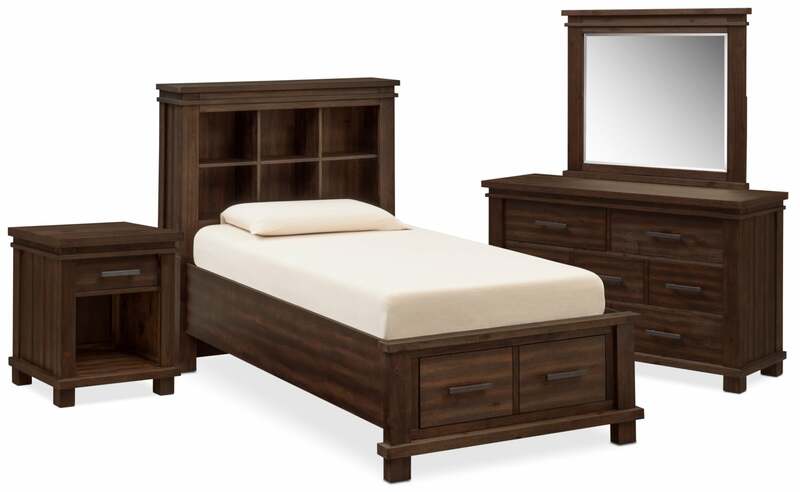 The Tribeca bedroom set will invoke your child’s natural curiosity for the great outdoors. Featuring solid acacia wood construction, this rustic set pays homage to the gorgeous grains of the oldest trees, with each plank as unique as the design itself. No matter what your child or teen’s storage needs, there is ample room for clothing, bedding and other essentials. The real focal point of this set is the headboard, with its earthy aesthetic. Customer assembly required. Unique Features: Offset drawers add an eye-catching element to the dresser. Sleek black metal handles are extra-wide, making them easy to grip. A built-in USB charger allows for easy computer and phone access. Beveled mirror adds visual dimension to any bedroom. Cubby spaces in the headboard offer space for books and trophies. The bed features tall stature and a contemporary silhouette. Ample space in the nightstand allows your child to keep nighttime necessities at arm’s reach. Large additional drawer at the foot of the bed is ideal for clothing or linens. Rich tobacco hue emphasizes natural wood grains and knots. Construction: Acacia wood and veneer construction ensures durability against daily use. Drawers: Top drawers are felt-lined for preserving valuable items. Ball-bearing glides allow for easy operation of drawers.